Packed with facts and rules that students can put to use in the shop and toolroom,Machine Shop Training Course, Fifth Edition, Volume I includes everything from underlying principles to standards and calculations for every specific task in shop training. 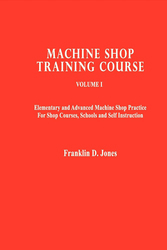 Together with Volume II, the pair provide an outstanding treatise on machine shop practice. No classroom or workshop where apprentices are being trained can afford to be without these valuable combination text and reference guides.